I hope you enjoy this creative video put together by my talented friend Ashley Mancuso of Ash Equine Productions. Everything in my life is intertwined, the dressage, liberty training, performing, and Art on Horseback. Each avenue offers a unique way for me to connect with my horses and explore my creativity. I hope that my journey can inspire others to pursue their dreams, no matter how different they might seem. Please connect with me (email at beginthedance@gmail.com or Facebook), I would love to hear how you are using creativity with your horses. Enjoy! After a long hiatus from the dressage competition arena, I decided it would be fun to work on my USDF Freestyle Bronze Bar with Douwe and Rovandio. To earn this award, the rider needs two freestyle scores (above 65%) at First level, two scores at Second level, and two scores at Third level from recognized shows. Douwe earned both of our First Level scores and Rovandio earned both of our Second Level scores in one weekend! I am so proud of them, they seemed to enjoy themselves and I did too! If you watch the TV series Outlander you will recognize the music, the tempo and drama of the music really go with Douwe's stride. Enjoy! Are you inspired to start working on your First Level musical freestyle? My "how-to" e-book will take you through the creation process of your very own freestyle. 10 Fully Choreographed Test Patterns! Just Add Music! 7 Online Resources to help you find freestyle music. Creative freestyle questionnaire to help get your creative juices flowing! Freestyle checklist to help you stay on track. Blank arena diagram pages for you to take notes and draw your own choreography. Rules to remember, arena & sound requirements, copyright laws and more! I also offer CUSTOM FREESTYLE design and FREESTYLE WORKSHOPS. Click here to learn more. "Tale as old as time. True as it can be. started to enjoy his training. This song holds a lot of meaning for me in regards to our relationship. Douwe was angry and depressed when I first bought him, and over the years has become the goofiest horse I know with a huge personality! It just took some time to uncover what was already there, and to shed his past. This video was taken at the Riding to the Top Therapeutic Riding Center in Windham, ME. This routine was very emotional for me; I was fighting back tears as we performed because Douwe was so in-tune with me. This was our first time performing this new routine and it brought laughter and tears to the audience as well. Don't miss Douwe's "singing" debut at the 4 minute mark! Sign up with your email address to receive inspiring videos, new blog posts, insider looks at new merch, and to stay up-to-date on upcoming performances and clinics. You will also receive a special discount code to use at any time on ALL products! Your name & email will be kept safe in the stables. Cobra, a "Three Strikes Mustang" Turned Horse of the Year, World Champion, and Breyer Model! "Sometimes life gives you a second chance, or even two! Not always, but sometimes. It's what you do with those second chances that counts." Marsha Hartford-Sapp and Cobra, dressage champions. For the past five years I have been involved with my friend, Marsha Hartford-Sapp, and her Mustang gelding, Cobra. Cobra was passed over three times for adoption, making him a "three strikes" mustang, but Marsha adopted him for the 2010 Supreme Extreme Mustang Makeover, and in 2013 they started competing in United States Dressage Federation (USDF) shows. Cobra is a sharply intelligent, deeply intuitive horse. Cobra is fairly big for a Mustang and quite balanced. He likes to work and once he is warmed up he is full of energy and ready to go. Marsha has trained and competed him successfully in dressage through the Prix St. Georges level and Western Dressage. He has won numerous year-end awards and world championships. Here is a video of him competing in Western Dressage, earning a great score of 78%! Marsha has competed in many Extreme Mustang Makeovers. She won the competition in 2016 with her mare Freedom, and this year with a beautiful palomino mare named Chason's Dream. You can watch this USA Today interview with Marsha on training Mustangs. Cobra is particularly talented in his canter work and has learned tempi changes and canter pirouettes, as well as other upper level movements. In the following video it shows him learning two-tempi changes only 2 years out of the wild! That is incredible! I am honored to have played a part in his dressage training, introducing him to the one-tempi changes this past winter in Florida. Over the course of a few months Cobra was able to learn how to do a one-tempi and progressed to four clean one-tempis in a row! Don't miss your chance to meet Cobra and Marsha Sapp at BreyerFest. They will be performing daily and "signing" autographs. I will also be there to help answer questions for Cobra's raving fans. And don't forget to buy your very own Cobra Breyer model to take home with you. Isn't he beautiful! In preparation for BreyerFest I was asked to create a logo for Cobra. My good friend, and professional photographer Kimberly Chason put together the logo idea and added the text to my art design. If you are interested in a custom logo design for your horse or business visit my online gallery...click here. Sign up with your email address to receive inspiring quotes and videos, new blog posts, insider looks at new merch, and to stay up-to-date on clinics and performances. You will also receive a discount code to use on ALL products. Your name and email will stay safe in the stables. Thank you! 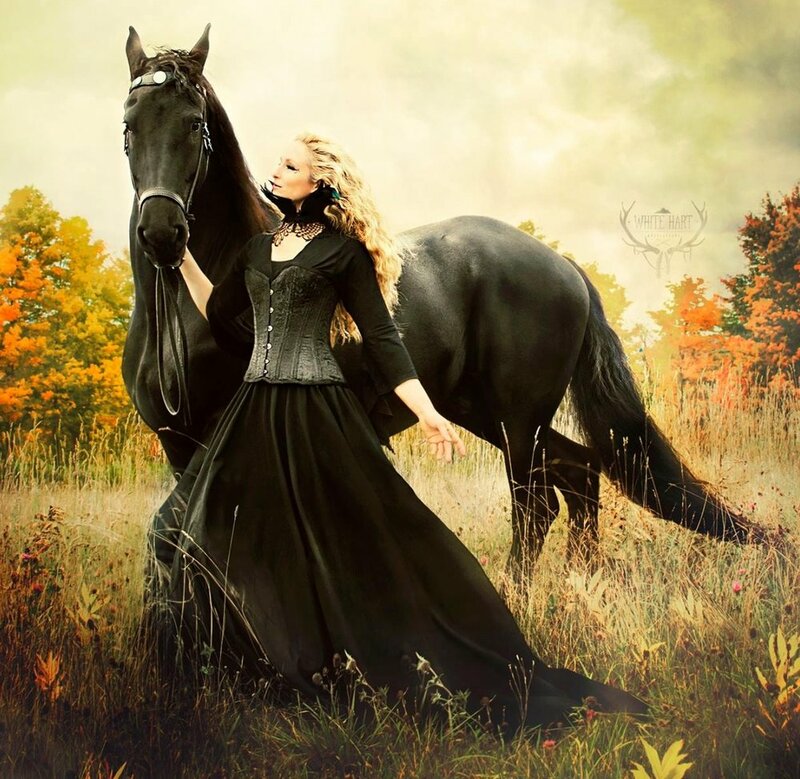 I look forward to inspiring you to begin the dance with your horse. Falcyyr TV Series - Now Available on Vimeo! Actress Sinari Diliiza rides Douwe as Sandra cues him for the rear. For the past two years I have been involved with a film project called Falcyyr, which is directed by Ahura Diliiza. 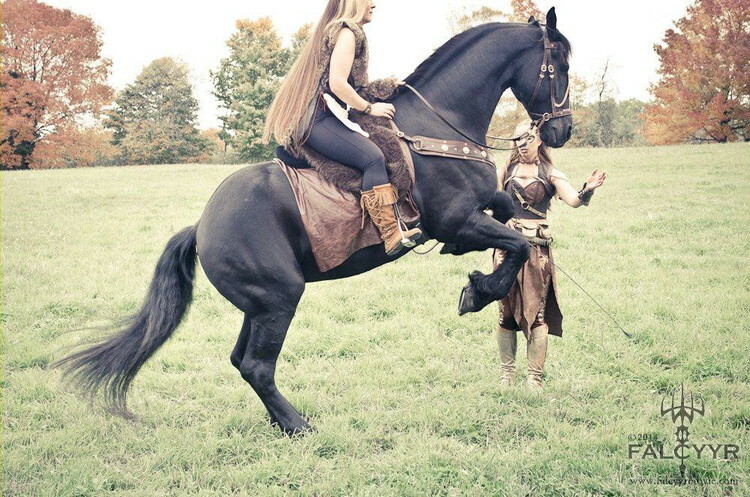 I play Artemis, Goddess of the Hunt, and Douwe is the special steed for the main actress Sinai Diliiza. My character, Artemis, teaches the Falcyyr how to ride a horse in Episode #6, click here to watch. Both Douwe and Rovandio are used for this scene. It was fun to utilize my teaching skills and the horses behaved very well for the different actresses. You will also see the herd of horses from Isaac Royal Farm where the scenes were filmed. Many of the horses are Lipizzan or Andalusian crosses. You can watch each separate episode of Falcyyr for $1 on Vimeo. You can also rent them all for $8 or download them for $12. Follow the Falcyyr Facebook Page!